Country Vet Metererd Fly Spray (6.4 ounces) (lasts 30 days) Kills and Repels flies, mosquitoes, small flying moths, gnats. It is the best selling agricultural flying insect control product. It's formidable pyrethrin and solvent-based formula make this top performer a best buy. Application: Country Vet can be used in Beef Cattle Operations, Dairy Farms, (Including Milk House, Milk Parlor, Loafing Sheds and Holding Lot), Hog Operations, Kennels, Barns, Stables, Farms, Animal Quarters, Milkrooms and Poultry Houses. 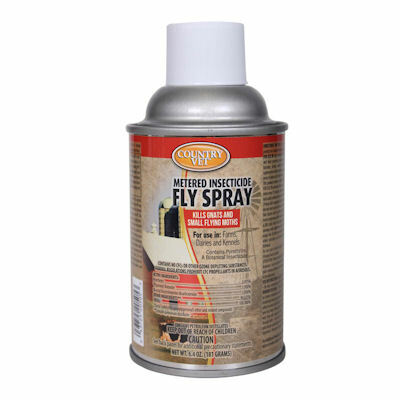 Contains 0.975 Percent Pyrethrins which delivers maximum kill and repellency of flying insects, including mosquitoes.